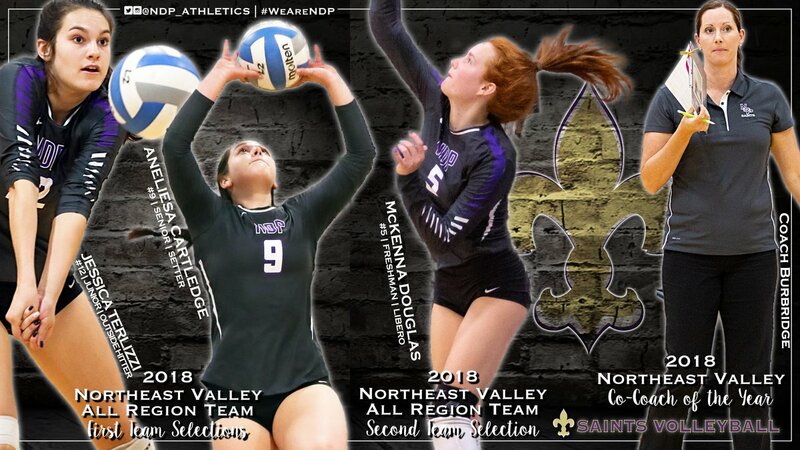 Janelle Petruzzella, Megan Chermack, & Caitlin Redican named All-Region 2nd Team (Click here for comeple listing). 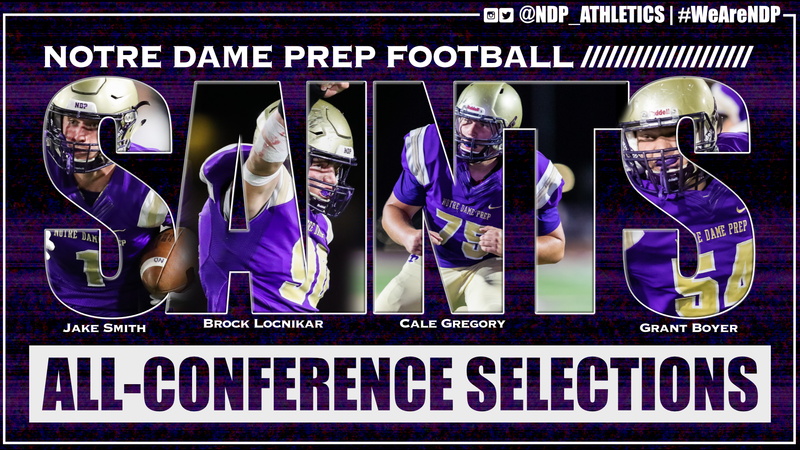 Grant Boyer (DL), Brock Locnikar (LB), Cale Gregory (OL), & Jake Smith (Flex) have been recognized as 5A All-Conference First Team selections. Smith (WR) was also a 5A Top 25 Team selection. Click here for a complete listing. 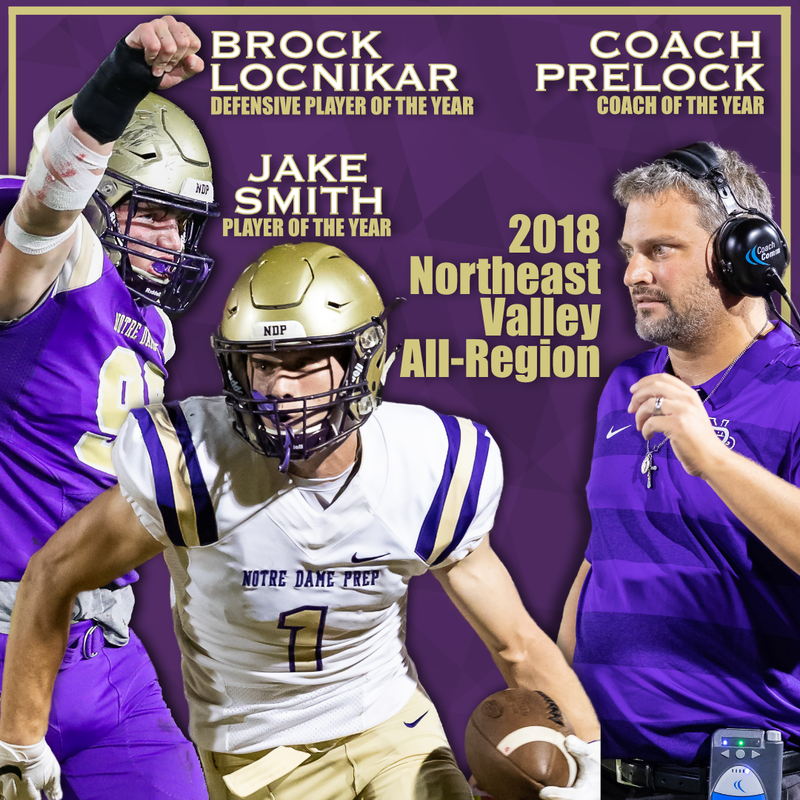 In its 34th year of honoring the nation's most elite high school athletes, The Gatorade Company announced Jake Smith as the 2018-19 Gatorade National Football Player of the Year. Smith won the award for his accomplishments on and off the field, joining a group of previous winners that includes Emmitt Smith (1986-87, Escambia High School, Fla.), Matthew Stafford (2005-06 Highland Park High School, Texas) and Christian McCaffrey (2012-13, 2013-14, Valor Christian High School, Colo.). 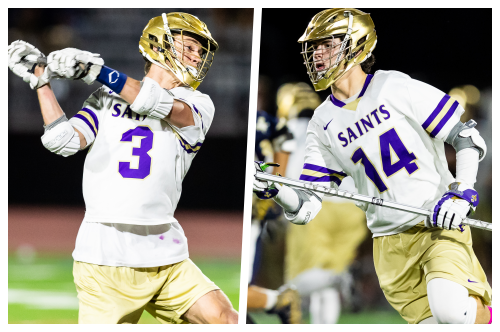 Smith is now a finalist for the most prestigious award in high school sports, the Gatorade Male High School Athlete of the Year award, which is announced at a special ceremony prior to The ESPY Awards in July. 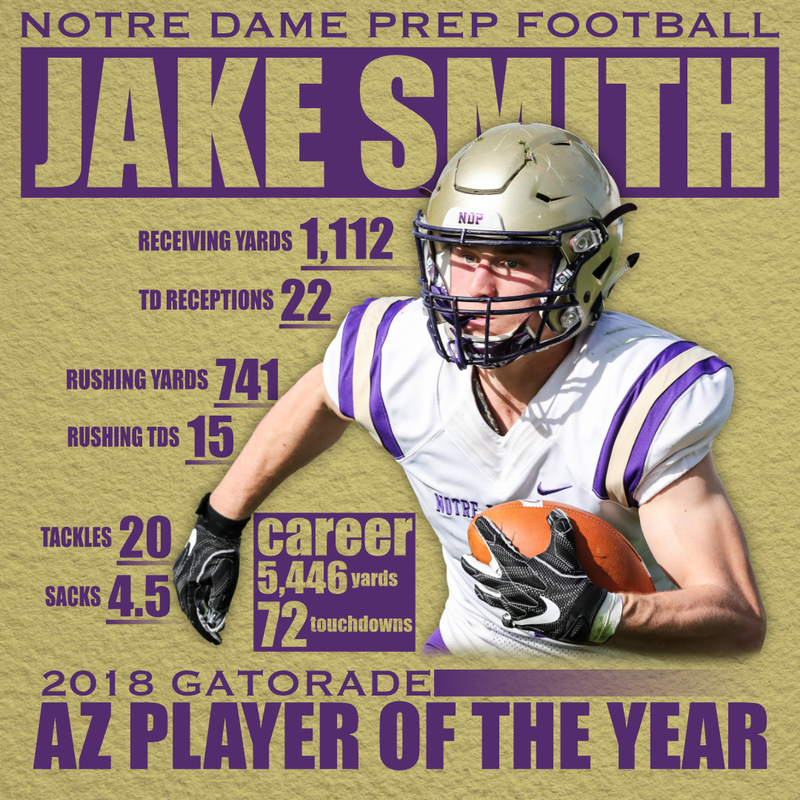 Gatorade announced Jake Smith as its 2018-19 Gatorade Arizona Football Player of the Year. 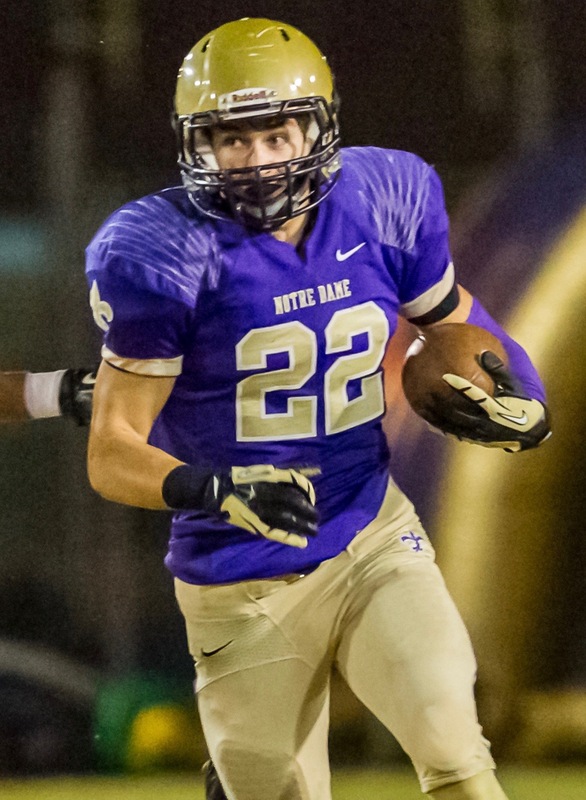 Smith is the 1st Gatorade Arizona Football Player of the Year to be chosen from Notre Dame Prep. 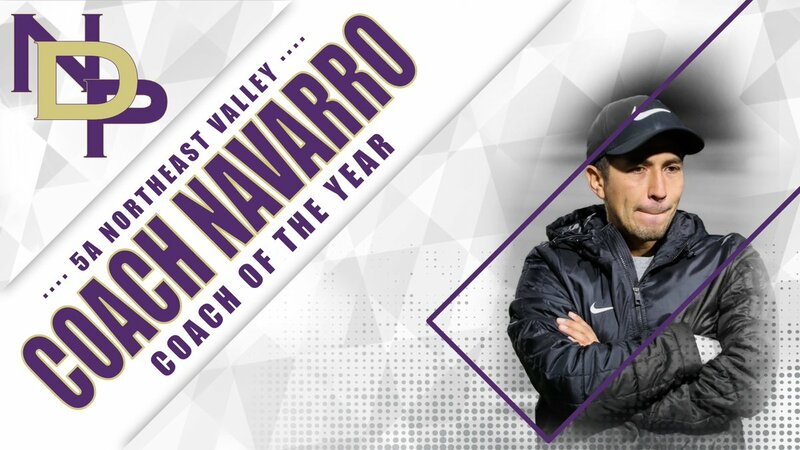 In addition, he was named to Gatorade's "Top 3 Watch List" for the Gatorade National Player of the Year. Click here for more information. 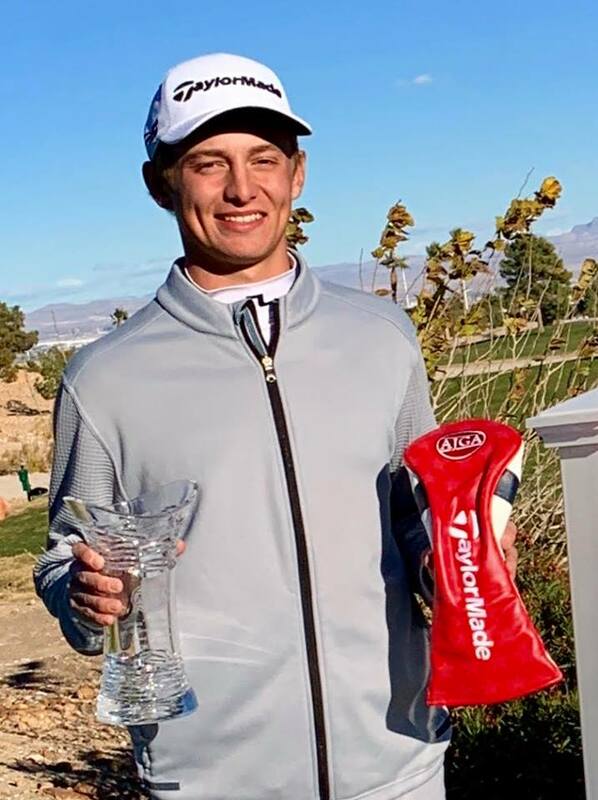 Jon Curran (-2) won the American Junior Golf Association (AJGA)'s Evian International & Senior Showcase. The 36-hole, stroke-play event featured golfers from 13 countries & 10 states. The first-ever Swim Meet of Champions will take place on Wednesday, November 7 at Phoenix Country Day. The meet will feature champions from every event at the 2018 finals across all divisions to determine the best of the best. The top 10 athletes in each individual event will be seeded into the AIA Meet of Champions. 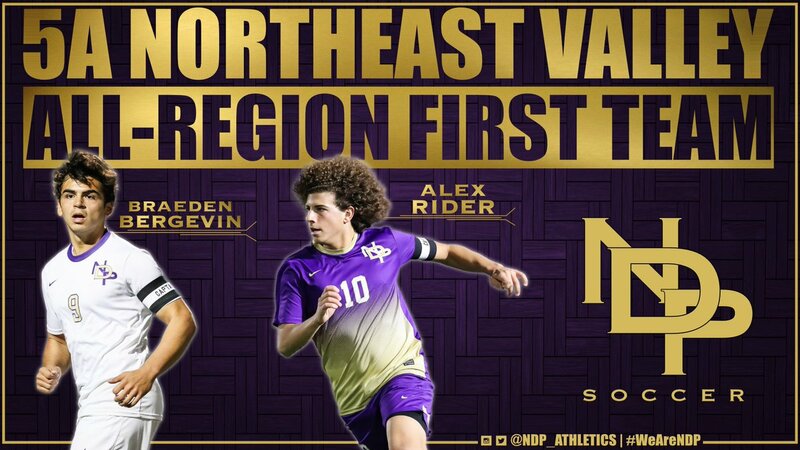 The next three individuals will be slated as alternates. This applies to all individual events, including diving. The top 10 relays in each relay event will be seeded into the AIA Meet of Champions. The next three relays will be slated as alternates. 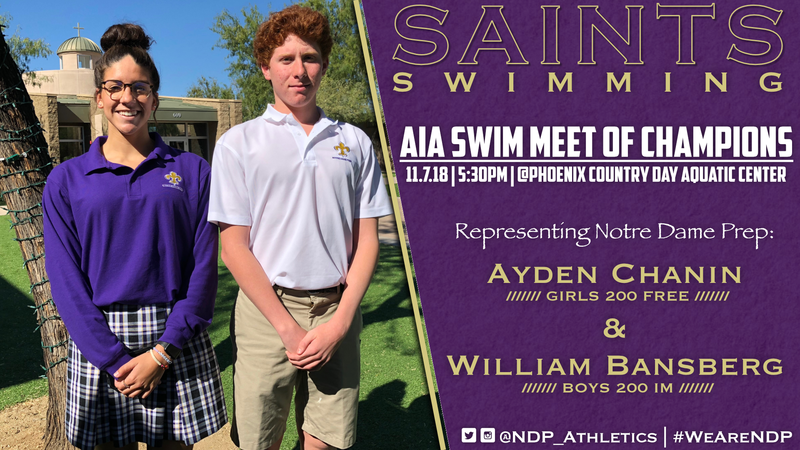 Ayden Chanin (Girls 200 Free) and William Bansberg (Boys 200 IM) will be representing Notre Dame Prep. Click here to view the initial psych sheet. Click here for more information about the event. 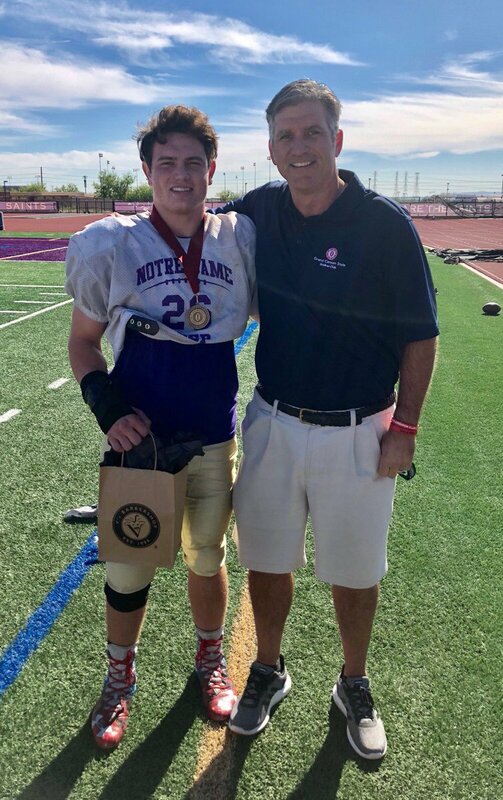 The Grand Canyon State Gridiron Club has announced the recipients of the Ed Doherty Award Week 10 Performance Medallions, which includes Ben Locnikar from Notre Dame Prep. Locnikar leads a young core of NDP defensive players with 119 tackles, 88 of which were solo tackles and 17 of which were for a loss. During the Saints’ 47-35 win over Phoenix Paradise Valley, he recorded 14 tackles, 11 of which were solo. The Grand Canyon State Gridiron Club announced Jake Smith as a Week 5 Performance Medallion recipient. Smith caught 6 passes for 160 yards, 4 touchdowns, & added a rushing TD in a 58-14 victory over Cactus Shadows. 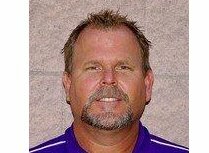 The Ed Doherty Award will be announced at a luncheon on Dec. 8. 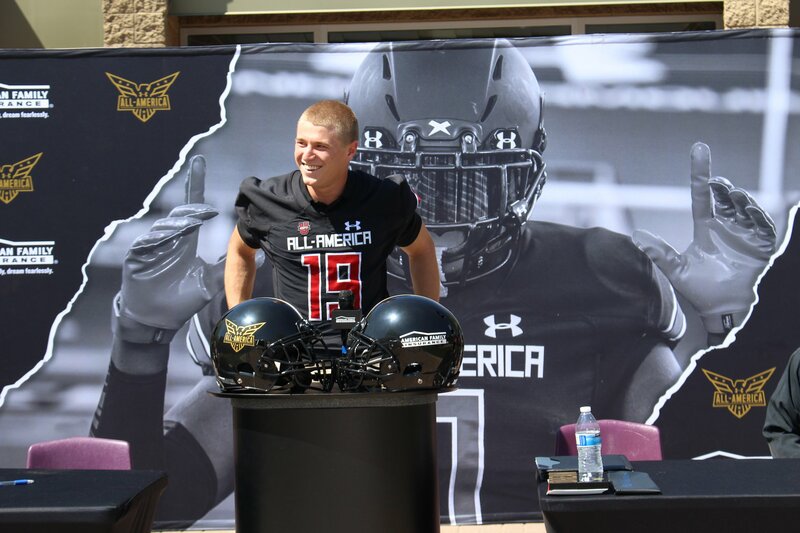 Under Armour officially made Jake Smith an Under Armour All-American with a special jersey presentation on September 24, 2018. The Texas commit has 24 TDs through 6 games. The game will take place on Jan. 3 at Camping World Stadium in Orlando, Fla. and will be televised live on ESPN2 at 6 p.m. EST. 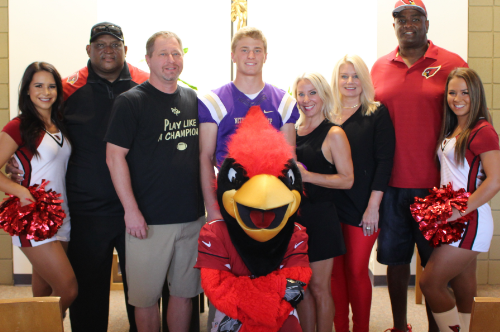 Jake Smith named Arizona Cardinals Player of the week for his week two performance against Sunnyslope on August 24th, 2018. Based on the nominations from coaches and members of the Arizona high school softball community, Sports360AZ introduces the 2018 Arizona All-Academic Softball Team spotlighting the best the state has to offer both on the diamond and in the classroom. A junior this season, Siegel started every game on defense for Notre Dame since he arrived on campus his freshman year. 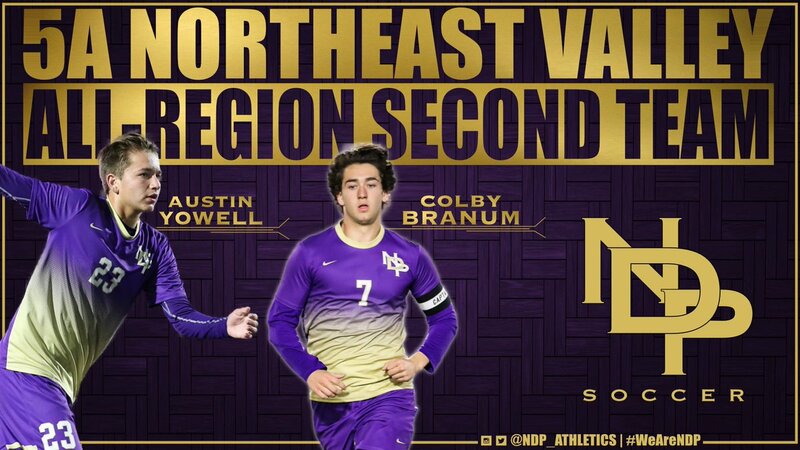 The anchor for a defense that allowed a stingy 4½ goals per game, an average which led the state. He was also the highest scoring defenseman in Arizona the past two years. A two-sport athlete, Story excels in football but is a true offensive threat in lacrosse. Scored 55 goals as a midfielder for his team as a senior, the Div. I state champs. In fact, he was a major factor in Notre Dame's back-to-back state titles. The Ed Doherty Award, which was established in 1987 and went away after 2012, is back to honor the top high school football player in Arizona. 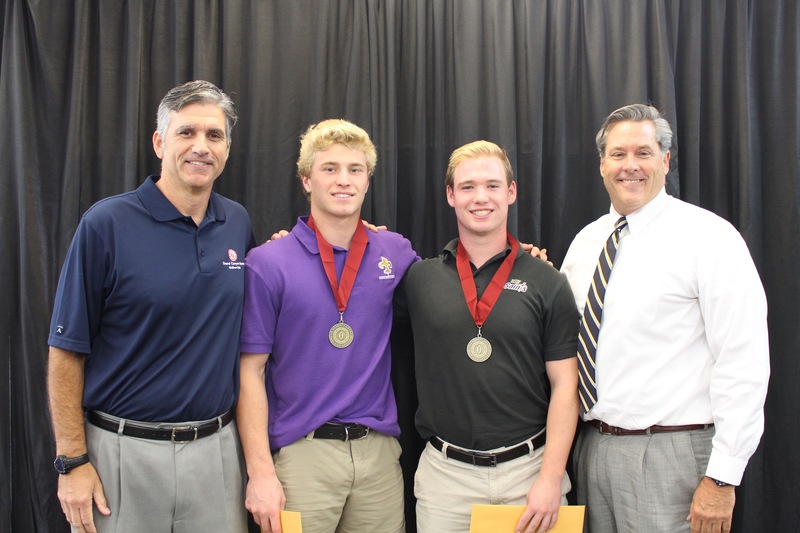 Senior power running back Cole Fischer and juior running back/wide receiver Jake Smith were given nominee medallions at a lunchtime ceremony on November 2, 2017. Elrod received this award at the American Leadership Academy banquet on January 27, 2018. 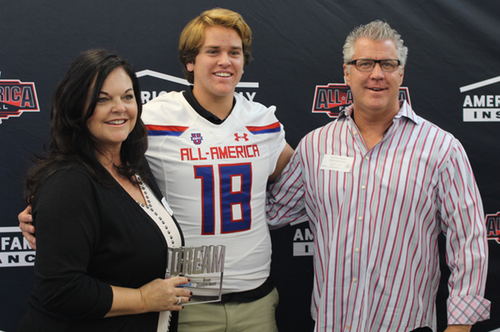 Saints senior long snapper Slater Zellers received his Under Armour All America Game jersey Monday at his school as part of the American Family Insurance Selection Tour, and he presented his parents, Brad and Diana Zellers, with the Dream Champion Award. The All America Game features the top 100 high school football players nationwide, and members of the team were selected by ESPN recruiting. Zellers, a three-star Cal commit, is the 1st-ranked long snapper in the country, according to ESPN. The Under Armour All America Game is scheduled for January 4, 2018 at Camping World Stadium in Orlando, Fla. and will be televised live on ESPN2 at 6 p.m. EST. NDP wide receiver Jake Smith was named Arizona Cardianls and Wells Fargo "High School Player-of-the-Week" for September 11-15. Smith led the Saints to a 54-28 victory over St. Mary's Catholic High School on Sept. 8 afer combining for 350 all-purpose yards. He caught six passes for 277 yards and four touchdowns to go along with 26 rushing yards and 47 return yards in the win. 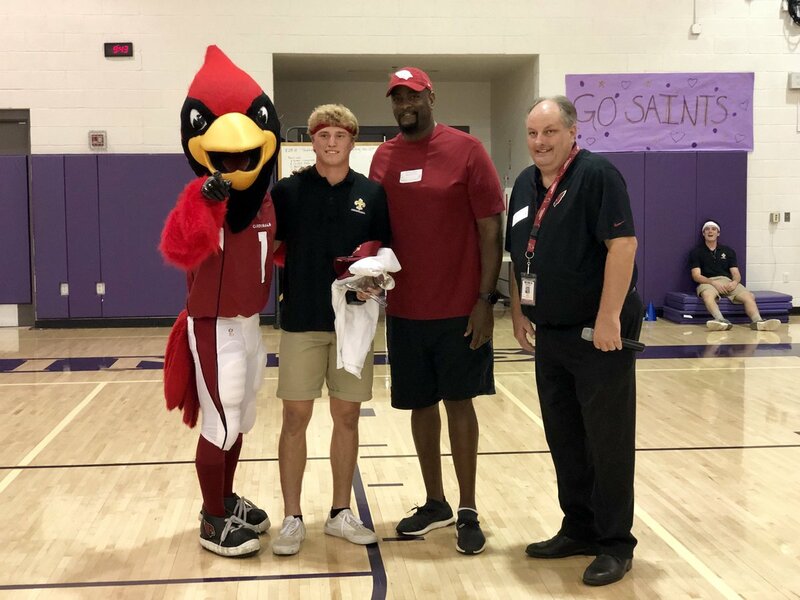 Smith was given a glass trophy with the statistics acknowledging the award at presentation ceremony on Thursday, Sept. 14 by representatives from the team, Cardinals Cheerleaders and Cardinals team mascot Big Red at Notre Dame Prep. The Cardinals 15-year "Player-of-the-Week" award presented by Wells Fargo is selected by a local sports panel consisting of Cardinals Senior Director of Community Relations Luis Zendejas, former high school football coach Kelly Epley, NBC 12 News sports anchor Bruce Cooper, high school play-by-play announcer Michael Carotenuto, and Arizona Republic/azcentral.comwriters Richard Obert, Scott Bordow and Richard Morin. 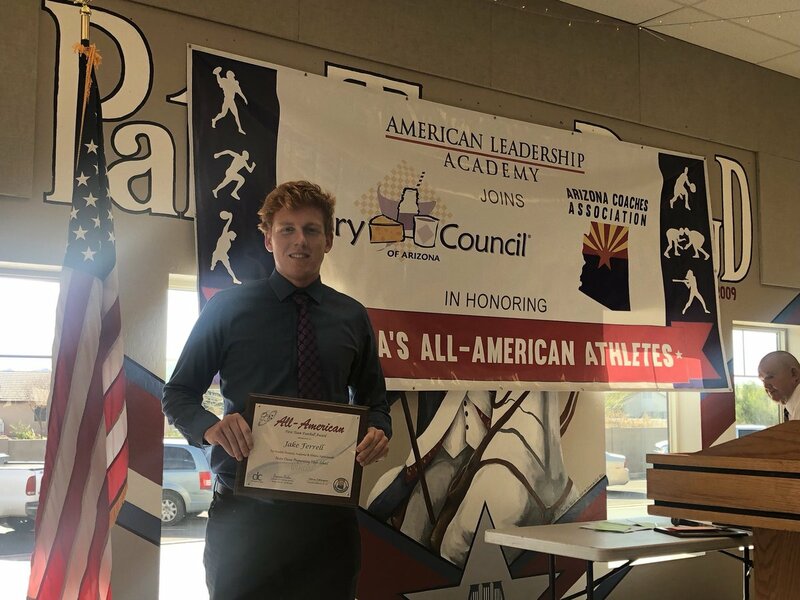 Jordan Schlueter of Notre Dame Preparatory High School in Scottsdale, Ariz. took home PRSC’s Student Athlete of the Year award for his 3.94 GPA and contributions to the school’s track and football teams. A defensive back, Schlueter was named a First Team All-State team. He has passed up offers from Yale, Harvard and Stanford to attend college at Arizona State University in the fall. Of all her accomplishments on the field – Allison is an even better person off the field. Her compassion for others with her big heart and burning desire to learn has led to her continual academic, athletic and social successes. 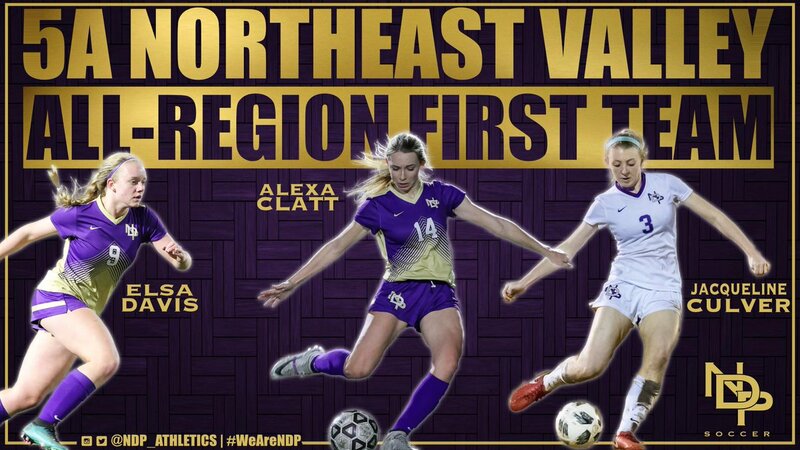 She has participated on the soccer team all four years at Notre Dame Prep. Allison helped lead her team to win a total of 63 games in that time span, despite her serious knee injury her sophomore year. 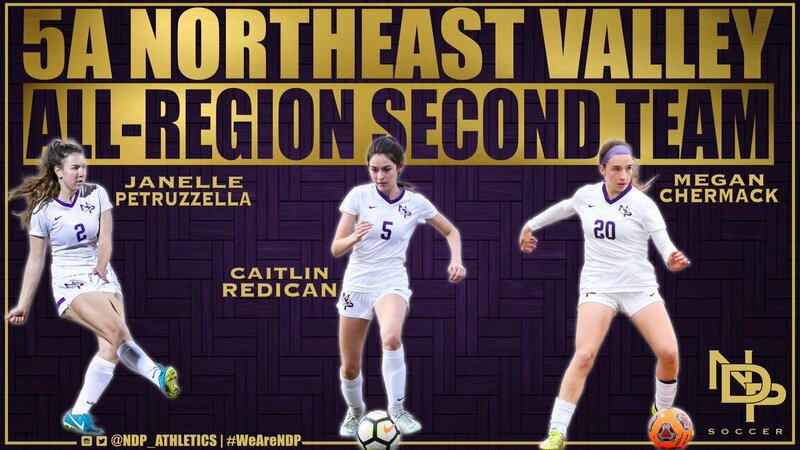 She was recently voted on by her soccer teammates as the 2014 NDP Kathy Reisdorf Character Award Recipient - an award that best exemplifies the qualities of dedication, perseverance, selflessness and leadership by example. 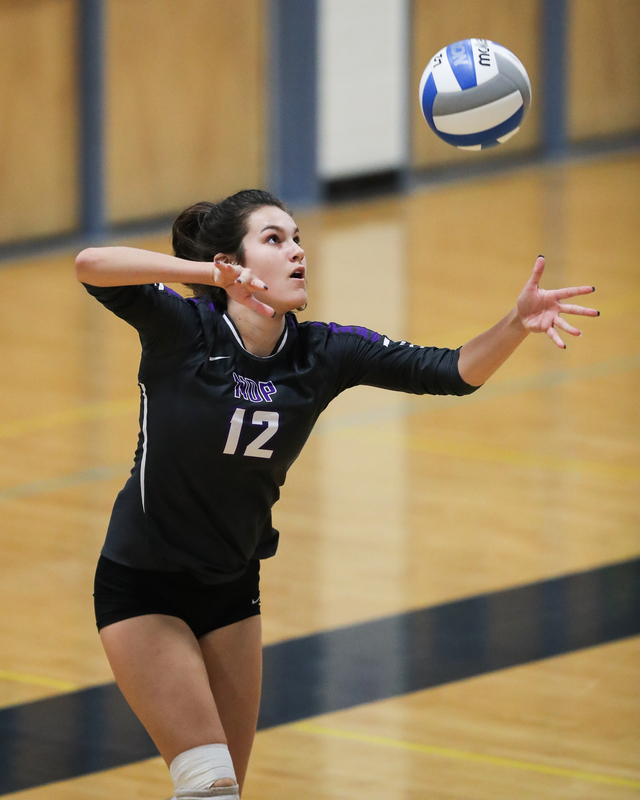 Not only has Allison been thoroughly involved in athletics while attending Notre Dame she has also given back many hours to her extracurricular activities. She has been a part of the NDP Student Government helping coordinate Prom and being the chair for the Hope Kids Event. 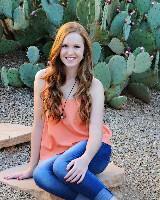 Allison is also a part of the Notre Dame Prep Diversity Club, Nation Honor Society as well as NDP Ambassadors Club. 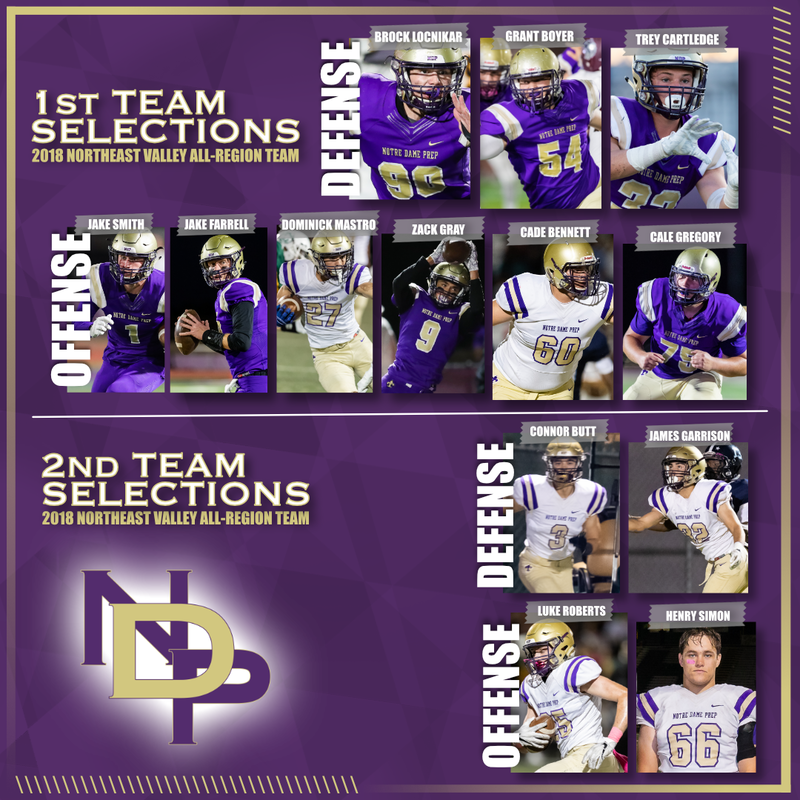 Grant is at the top of his class at Notre Dame Prep and he has earned numerous national and regional academic and achievement awards. Grant has earned his varsity letter in Cross Country, Swim & Dive, Soccer and Track. 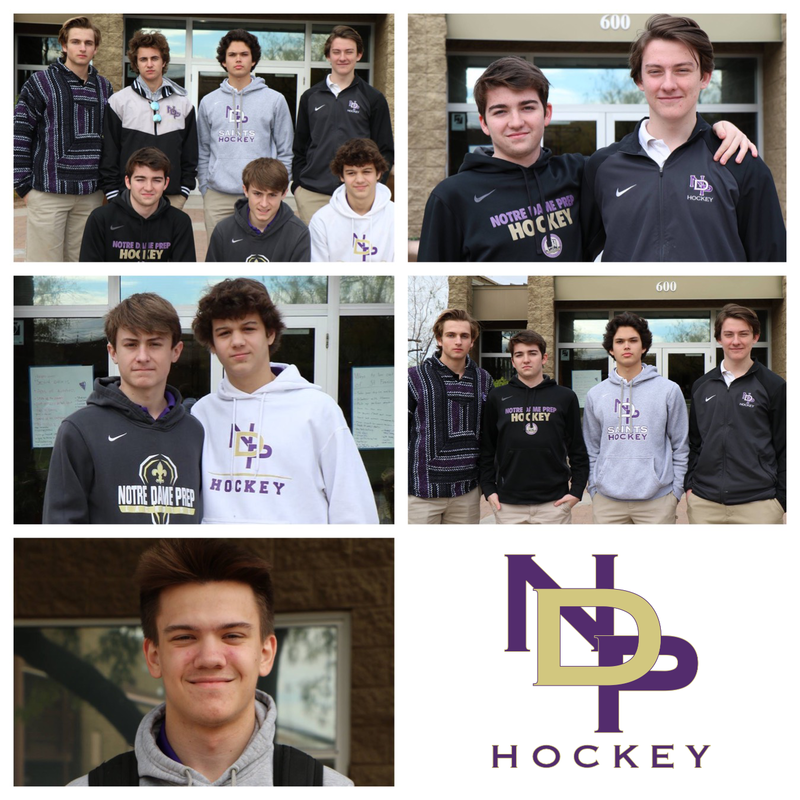 He has also participated on the schools Lacrosse team all four years at Notre Dame Prep. 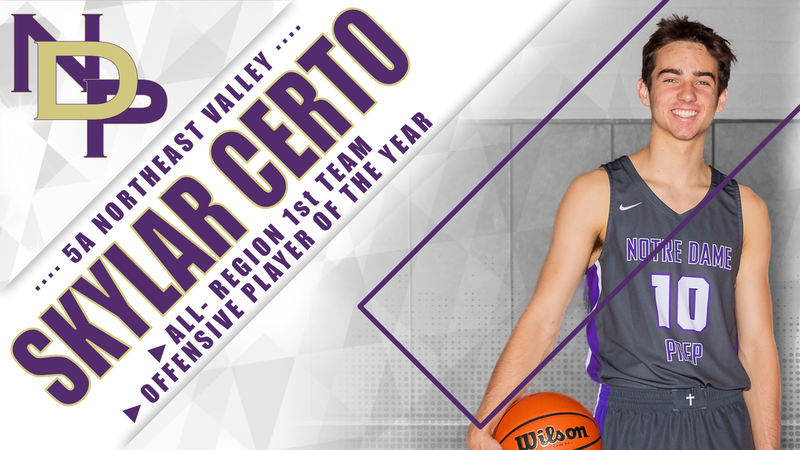 He has been more than the ideal student- athlete and has shown the ability to balance school work and athletics both at a high level. 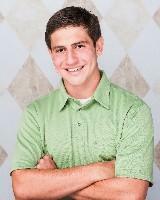 Grant was recently recommended to be a Leader at the Freshman Day of Reflection. Not only did Grant help coordinate activities and lead small group discussions. His ability to engage with others and be influential among his peers is evident in his interactions and demeanor; he does so with an unassuming ease, humility and maturity. Grant’s academic record continues to stand out as well. He will have completed seven Advanced Placement courses and fourteen Honors courses by the time we graduates. 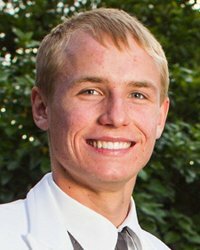 These courses, coupled with his achievement of a grade point average of 4.45, have earned Grant the distinction of being a Summa Honors graduate of Notre Dame Preparatory. In 1987 the AIA Executive Board established the Tony Komadina Award for Outstanding Girls’ Athletic Program to recognize schools that demonstrate advocacy of, and progress in, girls’ athletics. Mr. Komadina served as Executive Director from 1976 to 1987. 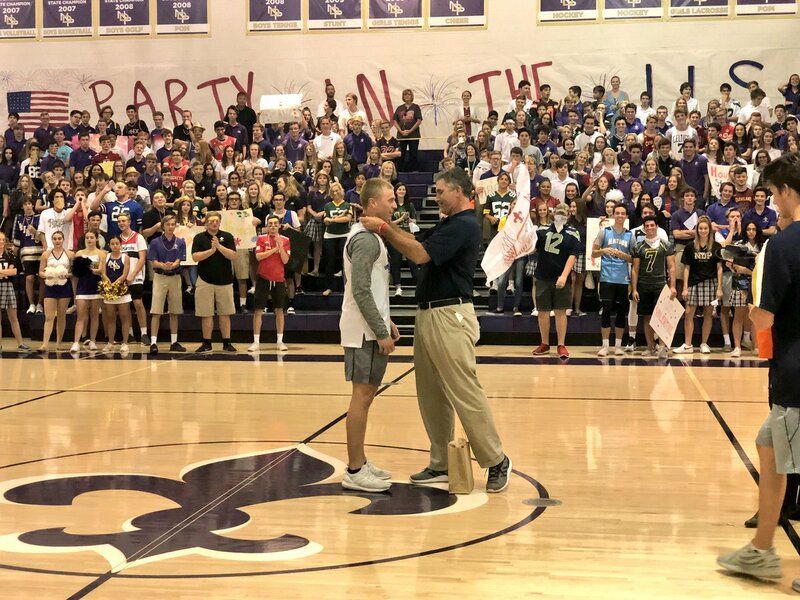 Notre Dame Prep won the Arizona Interscholastic Association Director’s Cup, which recognizes one area school for excellence in academics, athletics and activities.